No waffle maker? No problem! Hate to make fried chicken? No problem! 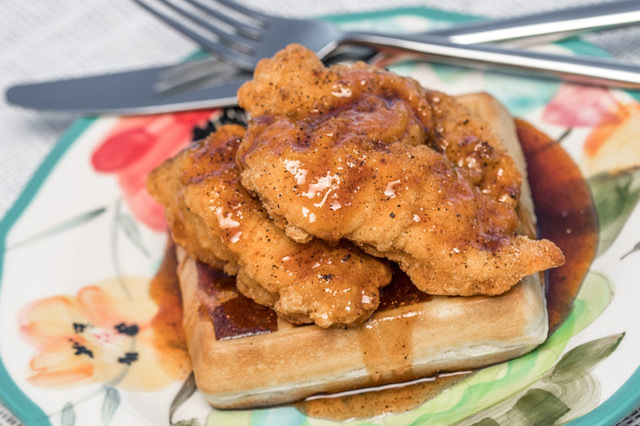 Feel like some sweet and savory Chicken ‘N’ Waffles? Well then, here you go! Serve with Trappey’s Louisiana Hot Sauce on the side. Remove the waffles from the freezer and let them thaw slightly while chicken is cooking. Pre-heat oven to 425 degrees. Place desired amount of chicken strips on a prepared baking sheet and cook according to package instructions. For some extra kick, sprinkle both sides of chicken strips with a little cayenne and black pepper before baking. While chicken is cooking, heat the ingredients for the maple glaze in a small saucepan. Whisk to combine and bring to simmer, then turn heat to low and cook for about 5 minutes. Turn heat off. When chicken is about 5 minutes from being done, turn pieces over to crisp other side. Toast or bake waffles according to package instructions. Re-heat glaze on low heat to warm slightly. Place one waffle on a warm plate and drizzle with some Maple Glaze. Then place 2-3 chicken strips on the waffle and top with more Maple Glaze. For an extra kick of heat, add a dash or two of Trappey’s Hot Sauce. YOWZERS!